Great colour and a pony tail. If you keep your hair long you have to know you're going to be scraping it back 97.5% of the time. You can overcome the tedium of this by having a really fab colour. This is also good for looking sporty without actually doing any sports. Short, really short. This was my choice and I've never looked back. Be careful, with the wrong texture this can be a false economy needing many trips to the salon and daily styling. Perfect for looking like you've got your stuff together when behind the scenes chaos reigns. The bob. This is the original mum cut. 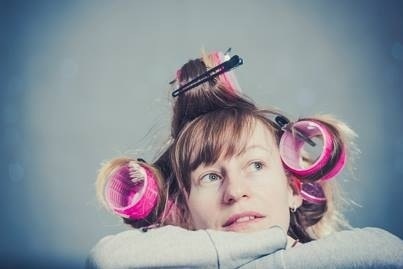 It's good for those that still have the energy to make an effort but can't spend all day blow drying. If you're looking to expand your mum tribe I think this makes you look the most approachable. Keep it wild. Motherhood is the time to embrace your natural texture so if you're a secret curly girl I recommend ditching the straighteners and letting those tresses fly free. If you go with this you still want to keep it short, tangles are no fun with a baby on board. If you want tips on how to style your new do please check out Hannah at Five Minute Mummy. She posts awesome how to tips for mums on the run. Did you change your style after becoming a parent? What's your mum cut? Long hair in a plait plus fringe (to make the look a bit more interesting). I've spent nearly 10 years growing this hair out, there's no way I'm cutting it off, baby or no baby! My only bugbear about afro hair is the inability to have a fringe, man I love a fringe. I think they look so young and sassy. This made me laugh. The other change is earings. No more dangly ones after baby is born as they pull them. I've just started getting back into earrings, although it's still risky business with a two year old! After my first I just shoved my very long hair back in a plait every day. But, after the second I went for the really, really short option and loved it. Right now I'm rocking the messy dyed bright green but with really long dark roots look. That's a look, right? Totally mama! I'm loving really short although ridiculously I do feel a bit more pressure to put on some slap and not wear pyjama bottoms outside the house. Interesting! Definitely the less you have to wash and restyle the better.